The 3,000m race traces its origins to Great Britain, where locals would run between churches -- thus, steeples -- overcoming creeks and fences along the way. The modern version involves four "obstacles," or giant hurdles, that differ from normal hurdles in that it's just one huge barrier, rather than a bunch of smaller ones in each lane. Hit a normal hurdle, it flies forward into the track, and maybe you do, too. Hit the steeplechase hurdle, it laughs at your mortality and you go tumbling into the rubber -- hard. 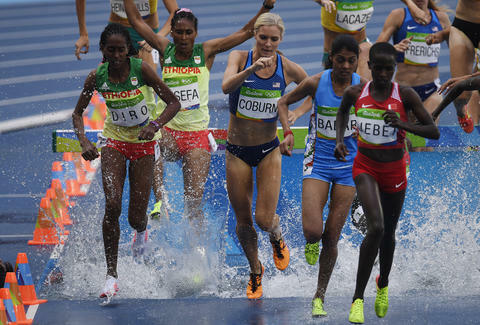 But it's that water pit that makes the steeplechase so much more than a footrace. "Everyone loves a train wreck, and the water pit is just that," former American steeplechase record-holder Ann Gaffigan wrote in Wired. "People flock to it when a race starts, hoping to witness a few good crashes. They’re rarely disappointed." Running your fastest over 3,000m -- about 2 miles -- is tough enough. But adding in 28 barriers and seven water pits will make your already Jell-o-y legs tremble in brand new ways. The men's barriers sit 36in high, while the women's sit 30in, but the water pit is the same for both sexes: that is, treacherous. Spanning 12ft long and 27.6in (70cm) deep at its deepest, the water pit forces runners to consider their strategy. Some choose to hurdle and land in the water, while others step up on the barrier to jump as far as they can. But runners at every level can fall, anywhere from high school through pros. Just like watching an Olympian break a world record, watching a runner tumble in the steeplechase isn't something you'll likely forget -- all the more reason to tune into the lesser-known Olympic events, because you never know what'll happen. Ryan Craggs is Thrillist's Senior News Editor. He ran the 400m and 800m sprints in high school, and doesn't miss blacking out or puking afterward. Follow him @ryanrcraggs.